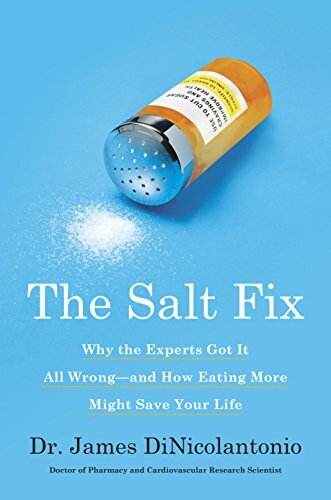 This weekend I read the book The Salt Fix: Why the Experts Got it All Wrong – and How Eating More Might Save Your Life by Dr. James DiNicolantonio. I wasn’t sure I would get much value from the book since I’ve known for a decade now that the science behind the salt restriction recommendations was weak. But I did learn a lot. The part of the book I didn’t care for was his demonization of sugar as THE driver of obesity and other health ailments. Sugar likely plays a role in obesity and diabetes, but it is not the sole driver. See the charts on Carbohydrate, Sugar, and Obesity in America and then try to explain that sugar is THE cause of obesity and diabetes. Doesn’t work so well. Which means it is either something else or a combination of factors. Cold extremities might be a signal that you need more salt. Chronic salt depletion can increase insulin levels because insulin helps the kidneys retain more sodium. A person with normal kidney function and normal blood pressure can “easily” excrete 10x as much salt as a person would normally consume in a day. Early evolution foods were aquatic and had much higher levels of salt than the foods most commonly consumed today. Low salt intake stresses the kidneys and results in lower energy to avoid sweating. This could lead to weight gain. Romans consumed 25 grams of salt daily. 16th century Europeans 40 grams a day and 18th century Europeans 70 grams a day. Salt is anti-microbial. (As someone with extensive fermentation experience, I knew this.) This means that salt can protect from food-borne illnesses. Foods with lower salt levels tend to have a shorter shelf life. Increasing potassium can help regulate blood pressure, which helps reduce hypertension. Low carb dieters need an additional 2 grams of salt a day. Salt is non-addictive. The body senses when it has enough and can sweat out the excess. The Salt Thermostat is a concept that the body has a set point for salt. This is a complex system that helps protect the body so it has the ideal salt level. When salt levels drop, craving for salt increases. Consuming salt prior to and during exercise can help the body cool off faster due to increased blood circulation. More salt is needed during pregnancy and for breastfeeding mothers. Higher salt is good for the skin when it is sweated out. It can fight off bacterial infections. The end of the book covers the pros and cons of different salts. The author likes Redmond Sea Salt the best. Although it is not mentioned in the book, Dr. DiNicolantonio covered how salt might be preventive in tooth decay in the article This Surprising Mineral Can Counteract The Effects Of Sugar. Although I have not been avoiding salt, I think I could increase my intake a little. Normally, I wake up and drink a few glasses of water, then drink coffee, and then go to the gym. What I’ll experiment with is consuming 3-5 grams of salt with water before my coffee and exercise. Since I know you’ve previously researched about sugar, and you disagreed with the sugar part of this book, but found the salt part interesting/persuasive, I was reminded of the Gell-Mann amnesia effect. @Jim – Agreed about the salt part, although I read something after I posted this that said that increasing potassium would be a better choice than increasing sodium for many. I’ll do both. I’m curious about what you read on potassium. It looks to me like the recommended daily intake would require insane amounts of the most potassium-rich foods. Do people actually meet the RDA of 4700 mg for most adults? Maybe just getting “more” and not worrying about specific amounts is a good way to start, as I am not a big fan of manufactured supplements generally speaking. I would love to hear more of your thoughts on this. @Rod – I followed a lead on Twitter that stated correcting potassium deficiency should come before one increases sodium. That lead me to this article, which states 98% of Americans are deficient. Correcting both are probably wise actions, but it may be that correcting potassium has a greater health benefit. Honestly, if someone says this about sugar, he loses credibility, especially the way he says it – like teenage magazine writer. We can’t be sure anything else is accurate either. Salt was mentioned at medschool related to strokes. Might be the evidence is weak for other diseases, like hypertension in general. Anyway, salt – food reward, might increase your calorie intake. If I were to rely on a “food guru”, I’d probably pick someone like Stephan Guyenet or Kevin Hall. After this post went out, I saw the author of the book posting some nonsense on Twitter saying sugar is the new smoking. So, curious as to how your experiment with salt went and are you still working it? @Asiyah – Adding more salt had no effect on anything that I could tell. After a few weeks, I lost interest in the experiment.